Worlds second and India’s first test tube baby, Harsha Chavda delivered her own baby with the help of the same medical team who brought her to life in 1986. Dr. Indira Hinduja, a Mumbai-based gynecologist/obstetrician is best known for her pioneering work in bringing India’s first test tube baby into the world in 1986. Baby Harsha Chavda is now 30, married to a businessman Divyapal Shah and works as an accountant in Mumbai. 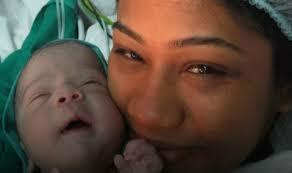 On Monday March 7, Dr Indira Hinduja delivered Harsha’s baby. Dr Hinduja happily said “Both mother and baby are doing great,” . Dr Hinduja said “It is hard to believe that we have delivered more than 15,000 test tube babies since that day when we first delivered Harsha, I still remember the day she was born—it was August 6, 1986, at 4.10 pm, at KEM Hospital. Her parents were on top of the world and so were we”. “The Test Tube baby technique though in practice in the western world was not established in India until we found success in 1986 with Harsha’s birth. We had to take so many permissions—from the Ethics committee of KEM Hospital, the ICMR, etc,” said Dr Hinduja. “Coincidentally, Maniben’s pregnancy test came positive on my birthday. There was an international conference going on at KEM—a senior doctor interrupted it to announce the big news of the pregnancy. And when the delivery finally happened, there was media frenzy. Everyone rushed to KEM Hospital to congratulate us,” she added. Harsha’s pregnancy, on the other hand, was smooth and uneventful. “There is no reason why test tube babies cannot conceive normally. In Harsha’s case, we had to do a C-Section because it indicated a breach presentation,” explained Dr Hinduja. Dr Hinduja and Harsha have developed a close bond over the years and have been present in each other’s lives; from Harsha’s childhood to wedding in 2015 and all through her pregnancy and delivery. been present in each other’s lives ticking off landmark events, whether it is Harsha’s wedding a year ago to businessman Divyapal Shah or her pregnancy.